The third stage of the Tour of Guangxi saw another circuit race around the city of Nanning. Riders contested a 125.4 kilometre route, made up of four times around a 31.4 kilometre route. After various groups tried their luck, it was an eventual group of three that managed to snap the elastic to form the day’s breakaway. After the group extended their lead out to two minutes, Team Sunweb posted Lennard Hofstede to the front of the peloton to assist with the chase. The trio up the road were brought back within the peloton’s reach and their lead continued to hover around the one minute mark until an injection of pace in the bunch saw their reign come to an end with 50 kilometres to go. As the catch was made numerous groups tried their luck once again, with two riders able to take a 50 second lead. Lennard once again headed back up to the front of the pack to assist with the race, seeing the two riders brought back with 5 kilometres to go. As sprint trains began to form Team Sunweb were there with Max Walscheid, positioning him for the finish. In another intense finale, Max sprinted to 2nd place. The law of averages dictates that a win may be coming for ORICA-SCOTT at the Tour of Guangxi as Magnus Cort came close yet again in a tightly contested sprint with the Dane taking third place on stage three. Stage three retuned to a predominantly flat urban circuit around Nanning with another early breakaway move going up the road over the first 20kilometres. The move included Jack Haig for ORICA-SCOTT with the Australian GC hopeful looking to gain some bonus seconds. The trio stayed away until past the halfway point before fresh impetus from the peloton brought the move back. Attacks peppered the closing kilometres, but as expected the race was altogether and lined out for a bunch sprint with less than five kilometres remaining. Race leader Fernando Gaviria (QuickStep-Floors) took his third straight victory in a close sprint with Cort finishing strongly for a solid third place. Fernando Gaviria makes it three in a row. “When the race came back together it was all about the sprint again and the boys did a great job of positioning Magnus in the final and he did everything right. He hit out at the right time, but was just beaten by a faster sprinter on the day, but I think we got the best possible result out of today’s stage. 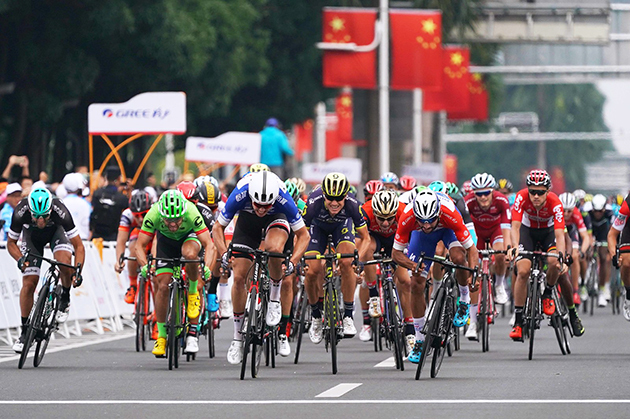 The race made a return to inner city criterium style racing on stage three with a four-circuit course running through downtown Nanning City. Another short and fast day was on the cards with a flurry of attacks coming straight out of the neutral zone, Haig was alive to the action and formed a three rider breakaway alongside Daniel Oss (BMC) and Nuno Bico (Movistar). The trio held two minutes over the bunch after 25kilometres of racing, but saw that advantage halved by the halfway point with LottoNL-Jumbo and QuickStep-Floors leading the chase. With less than 55kilometres to go the peloton ramped up the speed and caught the leaders with fresh attacks coming immediately and finally a pair of riders breaking clear inside the final 25kilometres. The duo held onto to a slender lead going into the last ten kilometres, but the sprinters team’s won out, making the catch with five kilometres to go as the bunch sped into the finale with Gaviria claiming his third win of the race. Dutchman Danny van Poppel crossed the line 11th on the Nanning Circuit stage, after a number of attacks ensured the day was completed at a quick pace. Fernando Gaviria (Quick-Step Floors) made it three wins from three as the stage came down to another bunch sprint. The Colombian held off Max Walscheid (Team Sunweb) and Magnus Cort (Orica-Scott) at the line, extending his overall advantage to 13 seconds. With the race’s queen stage coming up on Sunday, Wout Poels crossed the line safely to maintain his position, with the majority of the GC contenders now 30 seconds back on a dominant Gaviria. Early on in the 125.4km test a trio of riders pushed clear up the road, but with another sprint in the offing their gap only went out as far as 2:10. After 70km it was all back together, and despite a fresh set of attacks there was no preventing the inevitable bunch kick.